This is it! This is the full online microsoldering curriculum that you’ve been looking for. This course combines all of our courses into one big course, which covers everything from the basics to zxw tools to advanced repairs to data recovery. Four hours of online video instruction. In this course, we will teach you the skills needed for iPhone logic board repair. The course is comprised of 4 standalone courses combined into one full curriculum. The course is roughly 4 hours of online video content. You will get access to this content for life. We will periodically update this course with new repairs and information regarding microsoldering. We will teach you the basics of iPhone logic board repair. We will discuss the basics of how a logic board works and how it’s components operate. We will discuss the most important tools required for logic board problems. We will provide a complete list of tools and equipment needed for iPhone logic board repair. We will discuss the most important reasons for logic board damage and the most common problems resulting from that damage. We will teach you the core of this business and how to get the most from iPhone logic board repair. We will teach you how to troubleshoot a damaged logic board. We will teach you how to test components. We will show you some examples of how a typical repair goes in a real world example from A to Z. The first case is a water damaged iPhone not powering on. And the second case is an iPhone 6/6+ with a bad touchscreen. We will show you how to setup and use some of your tools and equipment. We will show you the correct temperatures and nozzles to use with your hot air rework station. We will show you how to setup and use your micro pencil and tweezers. We will show you how to setup your dc power supply for powering up an iPhone without a battery. 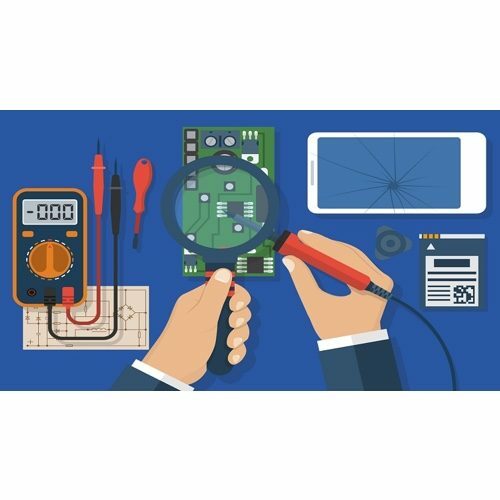 We will show you how to use diode mode on your digital multimeter to diagnose and troubleshoot problems quickly. We will teach you how to use ZXW tools dongle for troubleshooting and repairing iPhone logic boards. We will discuss the different functions the tool offers. We will show you how to find the circuit lines. We will show you how to test lines for problems. We will show you how to repair a missing pad. We will show you how to repair long screw damage on an iPhone. We will show you how to determine the type and value of components. We will show you where to source these components. We will show you how to get images of these components within the software. We will teach you how to repair the 3 most common iPhone logic board problems: no backlight, no touch and no charge. We will discuss in detail how each of the circuits operate. We will discuss the functions of all involved components within each circuit. We provide a complete list of all relevant system components. We will discuss the most important reasons for these logic board problems. We will teach you how to diagnose and troubleshoot which components are responsible these issues. We will teach you how to perform the repair itself. We will discuss how to tackle the complications that may arise post repair. We will give you most common reasons for “no boot”. We will give you some ideas on how to make a dead iPhone power up again. We will provide a 10 step approach on how to revive a dead iPhone. We will discuss in detail the steps required to repair a dead device. We will discuss how to diagnose whether a device is actually dead or not. We will provide hands on examples of how to do the repairs. We will discuss which circuits are important for data recovery. We will teach you how to test important circuits. We will teach you how to repair software issues. We will discuss how to solve complications post repair. We will use the iPhone 6 as a model. But our approach will be translatable to other iPhone models as well. This course will be periodically updated with more common repairs. I like this cours. There is a lot of super important and super hard to finde info for iphone logic board repare. First 3 parts was easy for me becose i lerned before in enother courses. But the last chupter was super usful for me. There was the part i was missing in my knolage. Recommed to all. As it sad (fom the begginers to expert). In my case i was missimg the expert part. This course wars the payed money and much more.